Icy road death rates are highest in rural areas. This is apparently the main reason that the Midwest has seen the most fatalities. In rural areas, cars are more likely to be traveling on interstates and secondary roads at high speeds (over 45-50mph) when accidents occur. The Midwest has a low population density with large distances between major cities and towns. By contrast, the northeast US states (and many metro areas in the Midwest) have had a very low incidence of icy road fatalities, despite having a much higher population density and a greater amounts of vehicular traffic. Death/major accident rates on icy roads are low to nonexistent when low speeds are involved - such as on surface streets and inner-city freeways, where traffic and lower speed limits prevent vehicles from reaching high speeds. Icy road death rates are maximized in a winter climate 'transition zone'. The harsh winters of the northern US states would lead one to believe that icy road deaths should be highest there. However, the public awareness and preparedness levels in these areas usually counter the increased frequency and duration of icy road conditions. Moving a few hundred miles south to a region where winter conditions are more intermittent, the data changes. Areas in the Midwest that only see occasional winter precipitation have very high accident and fatality rates. This can be attributed to the much lower awareness/preparedness levels on the part of the general public to the hazard. Moving even farther south, icy road death totals are comparable or even greater than those in many northern states. For example, Texas and Oklahoma only experience icy road conditions a few times a year - however, more deaths occur in those few events compared to northern states that see a significantly higher frequency of icy road conditions. The other factor that deserves mention is that the Midwest sees more freezing rain events than areas farther north, and that most icy road events in the deep south are due to freezing rain. Death rates in freezing rain events are much higher than with any other precip type (which brings up the next point). Freezing rain has the highest accident and death rate of any precipitation type. While I did not compile a complete dataset of precip types for every fatal accident recorded, it was very apparent that freezing rain was responsible for significantly higher death rates over that of snow and sleet. Some of the most deadly winter storm events were those where the ptype was all freezing rain. As I've previously noted, the reason for the high death rates in freezing rain/drizzle is that the phenomenon is invisible to motorists. 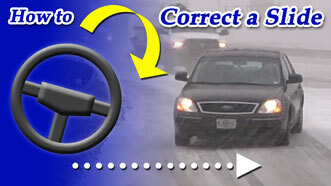 Snow is highly visible when it is falling, and turns road surfaces white as the icy road conditions develop. This gives drivers ample warning to adjust their speed and driving behavior before they encounter more severe road conditions. Freezing rain gives no such visual warning, which results in accidents occuring suddenly at high speeds before drivers have a chance to prepare and adjust their behavior accordingly. More total deaths occured in snow events than in freezing rain, however this is attributable to the fact that snow is far more common than freezing rain. No single snow event, however, came even close to approaching the single-storm death toll from the worst freezing rain events of the season. Again, it is vehicle speed that is a factor in most icy road deaths. Heavy snowstorms tend to inhibit travel and overall vehicle speeds, therefore major snow accumulations (over 4 to 5 inches) tend to result in very few icy road deaths. Most snowstorm-related icy road deaths occur at their onset, when awareness levels are lower and lighter accumulations allow for higher speeds. Lack of seat belt use accounts for a significant percentage of icy road deaths. Again, as with the ptype data, I did not record seat belt use (or non-use) data in connection with each fatal crash. However, the significance of this factor was more than apparent, as a very large percentage of the news reports on each fatal accident noted that the victim(s) were not wearing a seat belt (and in many cases was ejected from the vehicle). In fact, the percentage of fatalities resulting from lack of seat belt use may be over 50 percent (more than half) of the recorded incidents. To the average person, freezing rain is the deadliest weather hazard in the USA. No other weather phenomena has more propensity for death and destruction than freezing rain - the king of all extreme weather. Not tornadoes, not hurricanes, lightning nor floods. One only has to look at the death rates during freezing precipitation and the damage totals in major ice storms (rivaling hurricanes) to draw that conclusion. The mere mention of 'Freezing Rain' needs to strike fear in the heart of people just like tornadoes and hurricanes currently do. I hope we'll see a difference made as people begin to realize how much of a threat this underrated killer is.